Click here to PIN this tasty cauliflower so you can make it later! The weather is heating up in the northern hemisphere, but I think we have at least six weeks left where you wouldn’t mind turning on the oven, which I’m hoping will give you plenty of chances to try this amazing Low-Carb Roasted Curried Cauliflower with Lemon and Cumin. I first made this recipe way back in 2007 (!) when a blogging friend sent me some of her homemade curry powder blend. I had completely forgotten this recipe was hanging out back in the archives, and when I stumbled on it recently I realized it really needed a new photo. We made this and took new photos on a day when Kara and I were trying another cauliflower recipe, and this one was the clear winner. We loved the complex combination of flavors in this simple recipe! I might even go so far as to say this is a perfect way to cook cauliflower as a side dish; hope you enjoy! This recipe would be perfect for anyone who’s looking for Meatless Monday ideas, and this deliciously healthy cauliflower recipe is not only meatless, but it’s also Vegan, Low-Carb, and Gluten-Free. And it’s so delicious you won’t think for a minute that you’re eating it because it’s a healthy dish. Preheat the oven while you whisk together the oil, lemon juice, curry powder, ground cumin and Spike Seasoning and cut up the cauliflower into bite sized pieces. Toss cauliflower with the oil mixture until all the pieces have turned slightly yellow from the curry powder. 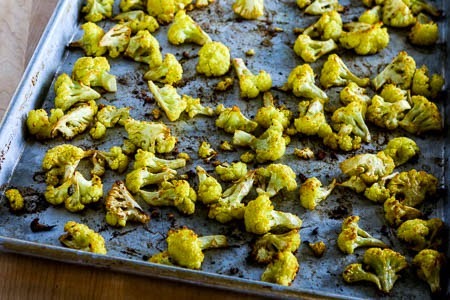 Spread cauliflower out in a single layer on the baking sheet and roast about 15 minutes. Then use a large turner to turn cauliflower over to the other side. Continue to cook for 15-20 minutes more, or until the cauliflower is cooked through and nicely browned. Serve hot and wait for compliments. Low-Carb Roasted Curried Cauliflower with Lemon and Cumin is an easy side dish with the perfect blend of complex flavors. Cut away core from cauliflower and cut into small florets. Whisk together olive oil, lemon juice, curry powder (I used Madras Curry Powder), cumin, and Spike Seasoning . Pour over cauliflower, and using a large spoon, stir cauliflower as long as it takes for it to be completely coated with oil/lemon/spice mixture, at least a minute or two. Roast about 15 minutes or until cauliflower is starting to get a little tender and browned on one side, then use a large turner to turn cauliflower pieces over. Serve hot, seasoned with salt and freshly ground black pepper. This is great with fresh lemon pieces to squeeze on more lemon at the table if desired. Recipe inspired by a recipe from a site that’s no longer online and the curry powder I got in the mail from a blogging friend. This Low-Carb Roasted Curried Cauliflower with Lemon and Cumin is perfect for all low-carb and low-glycemic eating plans, and perfect for any phase of the South Beach Diet. This is delicious, Kalyn! I made it and served it with garlic string beans and dry-rubbed pork ribs. What a delicious dinner we had. That does sound good Yvonne! So glad you enjoyed it. I roasted cauliflower with leeks this week and have another head in the fridge. Will definitely try your recipe… maybe today! Janice, isn't roasted cauliflower just THE BEST! Hope you enjoy. Well, I guess I can't give up on cauliflower until I try this one! Lydia, it's seriously so, so good! I think you just combined all of my favorite flavors into one fabulous side dish. Thanks Stephanie; I love this combination! I could eat some right now. I am also a fan of roasted cauliflower. Thanks Simona! There are so many good ways to season it for roasting. The only way I like cauliflower is roasted–and this version sounds especially nice and flavorful. I’m glad people like the idea of this. Let me tell you, I thought the sum of this was so much greater than the parts. CJ, is that you Cheryl? Tanna, I’m so glad to hear you liked it. I know I will make this over and over. I guess I can’t really replicate this as our curry powders won’t be the same but following this recipe and using my curry and adding two chunked carrots what came out of my oven was spectacular! Thanks again! I love roasted cauliflower and this recipe looks great. I think there’s going to be a shortage of cauliflower in the grocery stores soon. This is on my table tonight! I love, love, love lemon & curry on cauliflower but always braised it before. The roasting process adds a whole new flavor dimension. (I riffed on your recipe and added some sweet vadalia onion too. Yum.) Thanks Kaylyn! 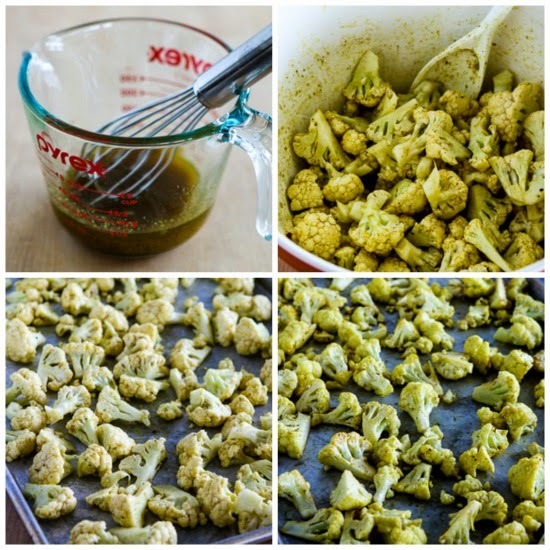 I’m always searching for new ways to make cauliflower – this is delicious, Kalyn! Congrats on yet another media mention!! I roasted cauliflower last week, but didn’t use any other seasoning apart from salt & pepper. Will definitely sprinkle some cumin and squeeze some lemon on top next time!